New experimental jazz/electroacoustic/noise/improvised CD. Music was composed for the live performance as a sound track to A. Dovzhenko’s “Zvenigora” movie that happened in Moscow Museon park in 2014. “The model kit” is an interactive spatial audio performance. The performers with musical instruments are placed in different places of the big space. The music score consists of a small model for improvisation that should be repeated and the scheme for interaction with the sound that performer hears. The listeners can participate in the performance by using the web application on their smartphones and tablets (or laptops etc). The listener can record the sound of the instrument that is being played and then play it back through any of seven loudspeakers. The qr codes near all the performers were used to get a fast access to the appropriate web page. The interactive part is done with Max. The patch polls a text file on a web server with information about all events. The web app is very simple and is done with jQuerymobile and a simple php script. Performed on June 15,16 2013 in Manezh exhibition hall, Moscow, Russia as part of the project “The trajectory of sound”, idea of the project – Dmitri Kourliandski. MCME ensemble directed by Viktoria Korshunova. “The model kit” from Alex N. on Vimeo. 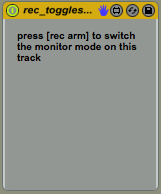 This effect stretches the audio in real time according to the value of the automation. This can be used to add weird groove feeling to the loop. The “grid” value changes the amount of steps in the main UI element. “grain” knob changes grain size. “auto” button sets grain size according to the tempo and the selected grid. “gr env” changes the amount of envelope that changes the grain size. 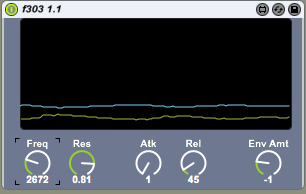 This small utility can help you to control 2 parameters with one controller. The “Control” knob moves the orange dot in 2d space on a spiral trajectory. The resulting control values are the dot’s coordinates. The movement on the 2d spiral can be slowed down with “Speed” control.